Passing the messages between more than one intermediate queue managers is called Multi-Hopping. 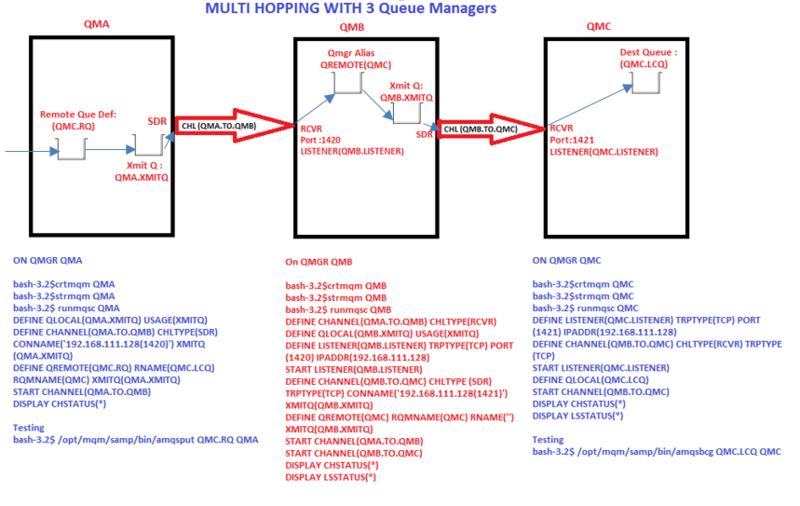 Multi-hopping occurs when a message needs to traverse one or more queue-managers in order to reach the destination queue-manager. The Setup in which a QMGR is networked with the next QMGR which is networked to the next QMGR ie (QMA -> QMB -> QMC -> QMD -> QME). If a message is created on QMA, and the destination queue-manager is on QME, then the message must flow from QMB to QMC, to QMD to QME. QMB and QMC will need a queue-manager aliases since they are non-adjacent (don’t have a transmission queue) to the destination queue-manager. This definition tells the MCA (message channel agent) on QMB to move the message to transmission queue named QMC, so that the message will be sent to QMC. So QMA doesn’t know any thing about QME so by defining the QM alias the message is reached to the destination QME.